Dr. Herman Williams was living a charmed life. He was a young orthopedic surgeon with a beautiful wife and had just been accepted to one of the best practices in the country. “I was literally on the verge of achieving all my dreams,” said Dr. Williams. During a pick-up basketball game between rival surgeons, Dr. Williams started feeling dizzy and decided to take himself out of the game. “I was just fortunate my wife was the scorekeeper. And she noticed that I had slumped over and had started foaming at the mouth, and I just died,” Dr. Williams explained. 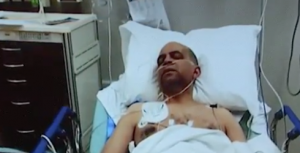 No pulse – his friends performed CPR until the fire department arrived with a defibrillator. The electric jolt brought him back to life. He made a full recovery. Although his condition made him change his career path to medical consulting. Fast forward 25 years: Dr. Williams was at the airport in Nashville and it happens again. “I see a gentleman sitting, I say ‘Hi, how are you? He says Hi, How are you?’ The last thing I remember is him saying ‘Are you alright?’ I start to fall, a woman catches me and eases me to the ground. And he immediately starts performing CPR,” Dr. Williams remembered. Bill Mixon is his name. He was recovering from his own heart attack. The woman who caught Dr. Williams is Terrie Layne. Two strangers who became two heroes. “Once you make that decision, you are all in. It’s you and the outcome, regardless of the outcome, it’s courageous and heroic to make that decision. It really is hero work,” said Dr. Williams. Dr. Williams wrote a book about it called Clear. In it, he describes how these terrifying events gave him a purpose: to live a life of compassion and kindness, to try to connect with everyone he encounters. Because in the end, Dr. Williams says we all need each other, we just don’t know when. The American Heart Association will tell you CPR, if administered immediately can double or triple a person’s chance for survival.